NASA is prepared to axe an airborne telescope to keep “higher-priority” programs such as the Saturn Cassini mission going, according to budget documents the agency released today (March 4). 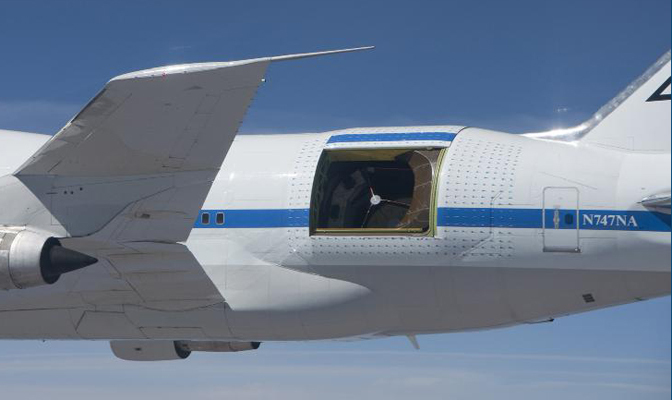 We have more information about the budget below the jump, including the rationale for why NASA is looking to shelve its Stratospheric Observatory for Infrared Astronomy (SOFIA). NASA’s has been flying the telescope for just over three years and recently took some nice snapsnots of the M82 supernova that astronomers have been eager to image. The agency’s administrator, however, said SOFIA has had its shot and it’s time to reallocate the money for other programs. “SOFIA has earned its way, and it has done very well, but we had to make a choice,” said NASA administrator Charlie Bolden in a conference call with reporters regarding the fiscal 2015 $17.46 billion budget request. He added that NASA is in discussions with partner DLR (the German space agency) to look at alternatives, but pending an agreement, the agency will shelve the telescope in 2015. In a short news conference focusing on the telescope only, NASA said the observatory had been slated to run for another 20 years, at a cost of about $85 million on NASA’s end per year. (That adds up to $1.7 billion in that timeframe by straight math, but bear in mind the detailed budget estimates are not up yet, making that figure a guess on Universe Today’s part.) DLR funds about 25% of the telescope’s operating budget, and NASA the rest. The telescope isn’t the only such “trade” NASA made, Robinson added. Although not an exhaustive list, she said funding for the Orbiting Carbon Observatory 3 (OCO-3) is not in the base budget request, nor funding to accelerate development of the Pre-Aerosol, Clouds and ocean Ecosystem (PACE) mission. SOFIA examines a “unique” part of the infrared spectrum, added NASA’s Paul Hertz, who heads the astrophysics division, but he noted infrared science is also performed by the Spitzer Space Telescope and the European Southern Observatory’s Atacama Large Millimeter Array. Coming up soon is the James Webb Space Telescope. Also, the budget allocates development money for a new infrared observatory called Wide-Field Infrared Survey Telescope (WFIRST). Below are other notable parts of the 2015 budget. These are high-level statements missing some detail, as the rest of NASA’s documentation won’t be released publicly until late this week or early next. – NASA’s budget falls overall to $17.46 billion, down one percent from $17.64 billion. Planetary science and human exploration each had nearly equal reductions of around three percent, with education taking the deepest cut (24%) in high-level categories as NASA moves to consolidate that directorate with other agencies. – Funding continues for 14 operating planetary missions, which are presumably the same 14 missions that are contained here. (That list includes Cassini, Dawn, Epoxi, GRAIL, Juno, Lunar Reconnaissance Orbiter, Mars Exploration Rover/Opportunity, Mars Express, Mars Odyssey, Mars Reconnaissance Orbiter, Mars Science Laboratory/Curiosity, MESSENGER, New Horizons and Rosetta.) Separately, James Webb Space Telescope funding stays about the same as fiscal 2014, keeping it on track for a 2018 launch. – NASA plans a mission to Europa. This was identified as the “second highest priority Flagship mission for the decade” in the National Research Council planetary science decadal survey, which called for a mission for “characterization of Europa’s ocean and interior, ice shell, chemistry and composition, and the geology of prospective landing sites.” NASA has allocated $15 million in fiscal 2015 for this mission, but it’s unclear if it’s going to be a big mission or a small one as the agency is still talking with the science community (and presumably checking its budget, although officials didn’t say that). If this goes through, it would fly in the 2020s. – NASA’s humans-to-asteroid mission gets some more money. The agency requests $133 million for goals including “advancing solar electric propulsion and capture systems, and conduct of the Mission Concept Review in which the mission architecture will be established.” During the conference call with reporters, Bolden said the asteroid capture mission is a key step for NASA’s aim to have a manned Mars mission in the 2030s. – Funding continues for NASA’s commercial crew program and Orion/Space Launch System program. It remains to be seen if the amounts allocated will be enough for what industry insiders hope for, but on a numbers basis, the Orion/SLS infrastructure funding falls to $2.78 billion (down 12% from $3.115 billion in FY 2014) and commercial crew funding increases to $848.3 million (up 20% from $696 million in FY 2014). Note the 2014 numbers are not finalized yet. NASA says the commercial funding will allow the program to maintain “competition”, although details are under wraps as the agency is evaluating proposals. – The International Space Station is extended to 2024. That news was made public in early January, but technically speaking that is a part of the fiscal 2015 budget. There’s far more to the budget that could be covered in a single news article, and it should be noted there was an entire aviation component as well. We encourage you to check out the budget documents below for the full story so far. Astronauts are expected to leave the International Space Station on schedule next week, and training continues on the ground, despite a crisis in Ukraine that is disrupting American and Russian relations, NASA’s administrator said on Tuesday (March 4). Russian troops moved into the Crimea region of Ukraine last week, triggering condemnation from the United States and other International Space Station partners. At least one ISS participant, Canada, has removed its ambassador from Moscow. “Everything is nominal right now in our relationship with the Russians. We continue to monitor the situation,” said NASA administrator Charles Bolden in a conference call with reporters. “The safety of our crews and our assets that has not changed. Safety is the No. 1 of NASA’s core values, so we are constantly doing contingency planning on the International Space Station for emergencies that might arise,” Bolden added, citing the emergency ammonia pump replacement in December as one such example. “Those are the kinds of things we are always planning for, and in terms of the situation on the ground, we will go into contingency planning for that as the situation dictates. But right now, we don’t see any reason to do so,” he said. The Russian Soyuz is currently the only way that NASA can bring humans to the space station, although the agency is developing a commercial crew program to start lifting off astronauts from American soil again in 2017. The Soyuz missions depart and return from Kazakhstan under an agreement Russia has with the former Soviet Union republic. Expedition 38 (which includes Russia’s Oleg Kotov and Sergey Ryazanskiy, and NASA’s Michael Hopkins) is expected to depart the space station March 10. Expedition 39 is scheduled to head to the ISS March 25. Bolden avoided questions asking what sorts of contingencies NASA would consider if tensions escalated, saying the agency would evaluate that situation if it occurs. The administrator delivered his comments as part of a conference call concerning NASA’s 2015 budget, which would increase funding for the commercial crew program to $848.3 million, up 21% from a planned $696 million in 2014. Proposals are currently being evaluated and little was said about CCP, except to note that the amount of funding would allow the program to have “competition”, implying multiple companies will be funded. Russian Soyuz spacecraft, docked to the International Space Station. Credit: NASA. Russia was a key partner in the station’s construction from the beginning. It launched the first component (Zarya) to space in 1998, and the station today includes several other Russian modules and docking ports. Additionally, the Russians perform their own spacewalks using the Russian Orlan spacesuit. Cosmonauts also form a large percentage of ISS crews under space station utilization agreements. NASA collaborations with Russia in space began with the Apollo-Soyuz Test Project in 1975, and expanded under an agreement that saw several shuttles dock with the Mir space station (and NASA astronauts train in Russia) in the 1990s.